The Rays success under the sharp guidance of Stuart Sternberg apparently has the attention of the Glazer Boys. A lot has been made of the Bucs spending the least amount of money, on average, the last five years on players’ salaries, which was exposed by NFL.com scribe Jason La Confora. 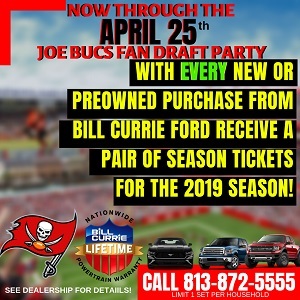 Many point a finger at the Glazer Boys using the revenue from the Bucs to pay off their mounting debt on their English kickball team, which is what Joe believes. But Andrew Brandt of the NationalFootballPost.com claims the Bucs’ recent penny-pinching ways can be attributed to a successful sports franchise playing in a overgrown tomb in St. Petersburg. Clearly the Rays don’t have near the budget of the Yankees, Red Sox or even mid-level successful teams like the Cardinals. They have to be smart with what little income you get from sparse crowds, when there are (seemingly) tens of thousands of crybabies in south Tampa who whine about an inability to drive 20 minutes across a bridge. So the Rays coming so close to winning a World Series on a limited budget, yet having a team full of solid talent, may be the new business model of the Bucs, so writes Brandt, given the fact there may not be an NFL salary cap (or floor) in the near future. If the Bucs can come close to the (recent) success of the Rays, the fans will be giddy and Mark Dominik will be the darling of the NFL, football’s version of Andrew Friedman, the Rays director of baseball operations. The sad difference will be Dominik will be god in this area. Rays owner Stuart Sternberg and Friedman, despite doing all the right things and possibly being the baseball standard for intelligence, have been thanked by area “fans” by being spit in the face. First, the Rays’ brass have to deal with whiners claiming they can’t drive across a friggin’ bridge. Then, the asinine morons in St. Petersburg — and you know who you are — killed what would likely have been the nation’s ultimate gem of a baseball stadium. If the Rays move out of the area because you a-holes — and you know who you are — killed the Rays waterfront stadium, Joe hopes your souls rot in eternal hell. Blood will be on your hands. And yes, Joe’s a taxpaying homeowner in St. Petersburg who — gasp! — lives 20 minutes from the stadium. Gotta agree with ya on this one. I live in downtown St. Pete, as a condo owner, and was so looking forward to making the 3 minute WALK to the new waterfront stadium. What a GREAT idea and, guess what, there’s a baseball field already there that’s not being used, Al Lang. Unfortunatley, these freakin’ idiots deserve to lose this team. What I don’t understand, is there was about a 50% split on it, why wasn’t more effort put into making it work. The whole thing was dropped without much of a fight. The drawings for the proposed stadium were fantastic, state-of-the-art stuff. The pinheads at ESPN would have known we played in St. Pete, not Tampa. A lost opportunity that would have made downtown St Pete the envy of all Florida, and would have attracted SO much revenue, what a shame! Exactly Dave, the people that whined about building a stadium on the waterfront… there already is one; has been there for decades. There wasn’t one bad element to this concept. Man, what a lost opportunity. Joe, would love to one day drink a BEER with you and explain why, from a pure business and responsibility standpoint, it made no sense for the ST. Pete locals to pay a load for this stadium. There might be a few people who would actually say building anything of extreme value on the waterfront in Florida is downright moronic. A little thing called hurricanes and floods. Also, there was no proof the stadium would bring in fans. You want to build a stadium. Fine. If there’s really a demand, sell 20,000 advance season tickets or seat licenses and bring the city anything concrete that this thing was going to work. And, if construction costs are such a bargain in this economy, and the PROFITIBLE Rays and their owners are so loaded and the team has gone so far up in value since Sternberg bought the team, then Sternberg should have been able to cough up more money for this “can’t-miss” place. Joe, I think you make some great points, and also some I don’t agree with. You are absolutely right that the waterfront stadium would have been a gem, but I don’t think the Rays ever had any intention of building that stadium at that location. I think that was just the first step in their plan to move the team to Tampa, where more of the population can get to the stadium with ease. The people in South Tampa are not the ones that have the problem with driving to the game. The people in Temple Terrace, North Tampa, Lutz, Brandon, etc. are the ones that are turned away by the additional twenty minutes it would take to drive to a St. Pete stadium over driving to one over off of Westshore or in downtown Tampa. I still think that the stadium designed for St. Pete would look just as amazing sitting on waterfront off of the Westshore area in Tampa. In any case, I don’t think the team will leave the area because despite the lack of a fully-developed fanbase, there is no remaining untapped market that would be more successful and I think the Rays are doing a great job of building a strong fanbase by placing an emphasis on building up the interest of children and teenagers in the team while also trying to build the overall fanbase in general.